I have only been waiting on this book for two years. Actually, a little over two years, but who's counting? Even as 32 Candles was released, Ernessa T. Carter promised that a new book was coming. She let us see chapters and everything. Then life happened and the book was delayed. 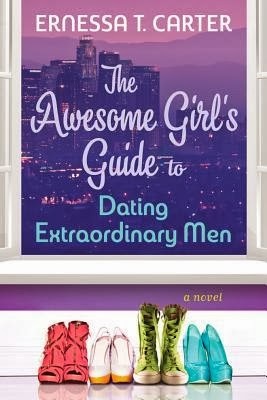 Imagine my surprise when I saw someone mention The Awesome Girl's Guide last month. I squealed with glee knowing that it would just be a matter of time before I'd have a chance to immerse myself in the world of Ernessa and her true to life characters. Why the title? 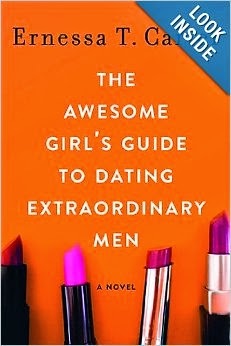 I know it will throw some people who see it and automatically assume that it's another self-help book for women written by the latest Twitter dating guru. It so is not. Remember Davie Jones from 32 Candles? Well she's back in a lesser role as the author of said self-help book. You know how awesome Davie is (remember her invitation to crazy line? ), so just imagine the kind of advice she gives. If you say you want to find an extraordinary man, and you've got a habit of turning down social invitations, I mean any social invitation at all, then I just plain don't believe you're serious in this endeavor. When you're searching for true love, you had best take every invitation you get, because for all you know, somebody's handing you an Invitation to Extraordinary. Why do I love Ernessa's writing so much and why should you buy this book as soon as you finish this review? Because we all have friends just like the people she writes about. She doesn't create worlds so ridiculous that no one can imagine actually living in them. And her characters are multidimensional and human. Though only one of the women claims to be looking for love, in actuality, all four of them are. Sharita is a by the book accountant whose professional life is on track, but her love life fell off the rails a long time ago. She hates stepping out of her comfort zone and will find every excuse to avoid social gatherings, so when she does meet a man (most likely at work or the grocery store), she goes ghost on her friends, only to reappear when things don't work out. I could write a book on people like that, and if you think about it, you have a friend just like that. Or maybe you're that friend, I'm not judging you (yes, I am). Thursday is the queen of one month stands. Right, not one night stands, one month stands. This love them and leave them queen can attract men like bees to honey, she just doesn't want to keep them. As soon as it seems like the men are catching feelings, she gives them the old heave ho. When Davie's book falls into her lap, coupled with a recurring dream about a mysterious man, she begins to think that she might finally be ready to settle down with the one. Risa is a hot mess. When I first started reading about her, I immediately thought of Lynn from Girlfriends. Risa doesn't mooch off of her friends like Lynn, but she is determined to make it as a musician. Her budding career was stunted before, but she has a plan to make a comeback. All of her friends think she's out of her mind, but Risa knows that if she becomes the rock star she's meant to be, The One will come back to her. While Sharita, Thursday and Risa are all friends from college, Smith College to be exact (Ernessa's alma mater), Tammy joined the group after the trio relocated to Los Angeles. Readers will remember Tammy from 32 Candles as James Farrell's younger sister who tormented Davie Jones in high school. Tammy is the character that we know the least about, but we do know that Davie is now her sister-in-law. Most of the focus of the book is on the other three ladies, with Tammy kind of flitting about the perimeter as she tries to learn to love herself, but when she steps into the story, she does so in a big way. At 494 pages, it seems like this could be a long read, but it's really not. Carter's writing has a way of pulling you in and not letting you go, so the pages fly right by. No one's story line is predictable and I promise you'll find yourself talking to the characters at times. I absolutely loved this book and can guarantee that I'll be re-reading it soon. Disclosure: Copy of book received from author, opinions are my own.